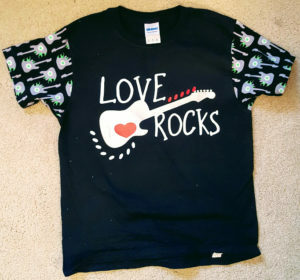 Finding a boy design that wasn’t too juvenile was quite a challenge, but I found this “Love Rocks” SVG on Etsy and decided to use it. I didn’t figure that I had enough time to trace off a new shirt and stitch one up, so I used a pre-purchased tee, removed the sleeves, and used a guitar remnant that I had in my stash. I also had to improvise on vinyl since I was running low – I used a silver for the guitar, red for (one of) the hearts and the writing in white glow-in-the-dark. Overall I’m not wild about the way it came out – I visualized it much differently )before I had to settle for what I had on hand) and there were several mistakes that were made, but Easton thought it was pretty cool, so I’m good with that. 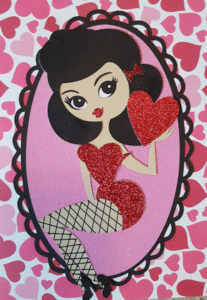 I also made another card…. I couldn’t resist. I saw this pinup style design and knew that I had to make it. I made a few changes and had a chance to try my hand at some glittered paper (which I love). And that wraps up this round of holiday crafting. Happy Valentine’s Day, everyone. I hope you enjoy your day! This entry was posted in Uncategorized on February 14, 2017 by stacy. Very cute! What brand of HTV do you prefer? Cricut – which I thought was fine, but apparently everyone hates if you read about it in the forums. It seems like it might ‘crinkle’ in large areas? But I haven’t noticed it. Stahls – I have a hard time getting it to stick without a lot of heat and pressure. I think I really need a heat press for it. The glow in the dark is from there and it seemed to release better than others I got. Siser Easyweed – It might be my favorite. It comes in a wide range of colors and releases easy (and seems to hold up well).